Geeks Fish Too: Top-secret Top-water Fishing - when or when not to use? That is the question! It's 7 am and a very foggy morning. The water is 70F degrees and the air temperature is 72F. The wind is calm and you can see circles on the water where fish are hitting the surface. This is the classic "better grab a top-water" scenario. But what about this: It's 11am, the water temperature is 68F and the air temperature is 75F. The wind is 5-10 mph and there are ripples on the lake. Would you use top-water in this case? Most guys wouldn't. And what about this? It's 3 pm, the water temperature is 85F and the air temperature is 95F, the wind is blowing and the only calm areas are near the edge of the lake that is protected by the trees. This would be crazy to use a top-water - right? WRONG! I'm probably shooting myself in the foot here by telling my secrets, but I've had enough of people hinting at the fact that I'm crazy for using top-water baits. I've heard all kinds of "old wives tales" from fisherman as to why you should never use top-water. And many of them are conflicting and don't even make sense! "Top-water only work early in the morning." "Top-water only work late in the evening." "Top-water don't work when it's hot." "Top-water don't work when it's cold." "Top-water don't work when the wind is blowing." "Top-water don't work when it's sunny." "Top-water only work in the spring or fall." On top of this, with the except of frogs, many fisherman put all top-water into these statements. Poppers, zara spooks, buzzbaits, you-name-it. I'm going to say right now that frogs don't really apply to most of what I have to say about top-water. In fact, frogs are in a completely different category in many respects in that there *are* specific times to use frogs and they don't really work if the conditions are wrong. That said, I have used frogs at odd times and have gotten results, so be open-minded about them as well. First, I want to discuss fish and temperature. We all know that fish like a certain temperature. But what we don't think about that much is that fish don't stay in their temperature zone any more than people do. Think about it, when you go to the store in the winter time, you go out into the cold and brave the elements to go get your food. What about bass? They do basically the same thing except in small quantities. It depends more on the *food*, not the water source. Wait... so what does that mean?? What are you fishing for? Bass are carnivorous beasts that want food that wiggles and moves. Be that fish, bug, or bird. Yes... I said *bird*. In fact, can you imagine a better delicacy than a baby bird in the spring time... or fall... or summer. Did you just read what I said? The only time I didn't mention is winter there. If a baby bird falls in the water near a bass in the middle of day during the summer time do you think it's going to ignore it because "bass don't go for top-water in the summer time"?? So think about this process for a minute. What makes a bass tick? Why do they chase a buzzbait like a crazed monster? Why do certain colors work better than others? Why do they chase buzzbaits more at certain points than others? Why do they go for top-water baits that jerk and pop? It's all pretty simple really. The reason is that things fall in the water from time to time that wiggle and squirm and splash about like they are struggling, trying to make it back to shore or wherever they think they need to go to get safe. These things are why bass pay attention to the surface. There are specific times that bass do not pay any attention to the surface. These times are pretty obvious: 1. There's ice on the water. (duh!) 2. There are no bugs flying in the air. 3. The air to water temperature differential is too extreme in a negative way. OK so you were with me till that last point right? You're starting to get the point that any time of the year things can fall in the water, bass will be paying attention to the surface. But obviously not during the winter up north, but also could be in the south as well simply because the birds are not having babies and the bugs are gone. (Still not a hard and fast rule in the south!) But what about this temperature differential thing? Fish are like people in some ways. For instance, it's an unusually hot spring day after being cold for weeks. You want to go swimming in your pool but there's a factor here that will keep you from doing it. The air temperature is a balmy 90 degrees but that water is still 65 or 70 degrees. There's no way you're going to jump in that water because... ready? The temperature differential is too great - in a negative way. So what do I mean by a "negative way"? Well, for instance, if it was 60 degrees, or for that matter, if it was zero degrees, and that pool was 85 degrees... would you have any question about jumping into that water? No, of course not! Many of us have seen the videos of Icelanders jumping into their hot springs during the winter time. It just looks like fun! So this would be a "positive differential". How does a "positive differential" change things for the fish? Quite simply, what would it take to make a fish not think twice about coming to the surface or jumping out of the water? Bass like a temperature between 68 degrees and 75 degrees. Not a whole lot different than humans. So as in the example above, if the entire water column is generally 65 degrees or colder and the air temperature is 75 degrees, there's nothing keeping a fish from coming to the surface to feed. In fact, it might actually prefer it! This is why big bass will go shallow in the spring time - because the water is warmer near shore. Now what about adverse conditions? What about that water temp of 85 F and air temp of 95 F that I mentioned above? How does that fit into this? First, I want to remind you of my analogy of going to the store to get food during the winter. You do it because you know you have to do it or starve. If you refused to go to the store, you'd eventually give in and go because you'd be so hungry. Think about that for a minute. I've had many situations where I was fishing a buzzbait in cold weather where the fish truly hammered my buzzbait and nearly took the rod out of my hands. I often wondered about that and finally came to the conclusion it was similar to going to the store in the winter. Bait fish tend to like warmer water because that's where the food is that they eat. Little microscopic organisms live in the warmer water and the tiny bait fish munch on these. The larger bait fish munch on the smaller fish and so on. There is often a warmer band of water right near the surface on a cool sunny day - especially if it's calm. The band is so thin though that big fish get little benefit from it. Did any of this make sense? Am I being too over dramatic? Well, maybe a little. But I've felt this type of determined fish at the end of my line before. He knows what he wanted because there's no way he's going to lose that bait. There's no second chance because now he has to go back down there with an empty stomach and he's already hungry. If he misses, he'll be hungry *and* cold. The same goes for heat, though my experience seems to indicate this is less of a problem. Again, it's really quite simple once you start to pay attention to the signs. Looking to see if there is activity above the that might attract bass is one of the key indicators for top-water bass fishing. Are the local birds active? What color are the babies? Are there bugs out? Big bugs? What color are they? Are there minnows on the surface of the water? Are they making a racket by their swarming? Most of us are aware of the bait fish rule: Where's there's bait fish there's big fish. So why are we failing to take advantage of this fact? Why do we still throw a worm when the fish are on the surface? Paying attention to the key indicators is critical to determining if it's time to throw top-water and what kind to throw. It may seem like I'm asking a lot of questions but it's because we as fishermen get stuck in a rut and it seems like we can't crawl out it even when the answer is right in front of our faces. The water to air temperature differential is one of those indicators that should be watched. If it's right, the fish will have no issue coming to the surface, even if it's fairly windy! I've caught bass when my buzzbait was riding waves. Those bass don't care about the waves when there's food up there. The trick is to get their attention. Do you think a wave is going to stop them when a baby bird falls in the water? I doubt it! There is one thing I should qualify during most of the discussion above. Much of my experience has come from throwing buzzbaits. Poppers and Zara Spooks are close behind including pretty much everything in between. However, I usually throw a buzz bait before I throw anything else. For some reason buzz baits work when nothing else does. However, that said, there's times when a minnow colored Torpedo is the best lure on the lake. So how does this work in the real world? The fact is, you need to be attentive to what the conditions are when you get to the lake. Every situation is different but there are specific things you'll want to check for to see if you should keep top-water in your arsenal for the day. Here I will give you some examples of how you might start your day and depending on the weather and other conditions, determine what top-water you should throw. Weather is a huge player. Obviously top-water doesn't work in high winds. But if the winds are light enough to allow for calm areas near shore, then you make still want to keep top-water around. 1. Before you head out to the lake, take a look at the weather. Look to see if there is going to be a wind change while you're out there. While the casual bystander might think that a wind change is disorienting to the fish, I doubt it actually is, but it does change their feeding patterns. Depending on exactly what the weather is doing will determine where the fish go. A couple things to consider for the weather is: How long has the wind blown in a given direction? If the wind has blown from the south for 2 days, the fish will be well established in their positions. If it's changed in the past 6 hours, they may still be moving to their new positions. 2. Now that you know what the weather is supposed to do you can pick where to fish on a given lake. Generally the fish will be on the windward side, but if you're fishing top-water, the choppy side of a lake isn't the best place to go. However, a protected cove near or on the windward side of a lake is a very good place to find top-water fish because they can sit in the calmer water and feed on the bait fish that are following the wind driven micro-organisms. There is much that could be written on this subject alone! 3. One final wind related note is that sometimes the windward side of the lake is not the best place to go. For those of us in hotter climates like Texas, you MUST know this rule: Windward in Winter. If you should only use windward in winter, then that means you should use Leeward in Summer. For those of you who are not familiar with nautical terms - windward is the side of the lake the wind is blowing *on*. Leeward is the side of the lake the wind is blowing *from*. The important thing here is that during the winter, the warmer water will be blown across the surface of the lake depending on the speed and longevity of the wind. During the summer fish will avoid these areas if possible because the water will be too warm so you'll want to fish the Leeward side. Why? 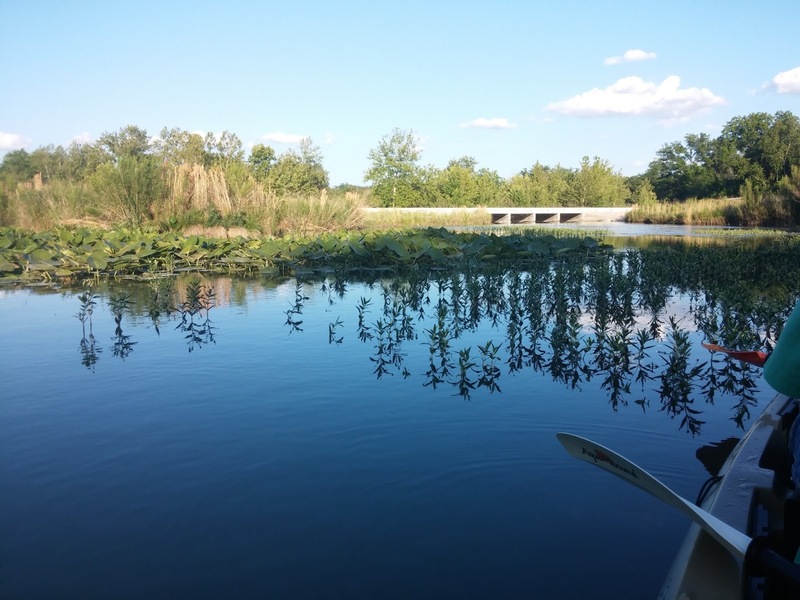 Because as the warm water pushes across the lake, the cold water from underneath will push up from down deep on the leeward side create a cooler place for big fish. This will help push them to the surface. 4. Now that you've determined the best places to use top-water, the task is now to choose a lure type. 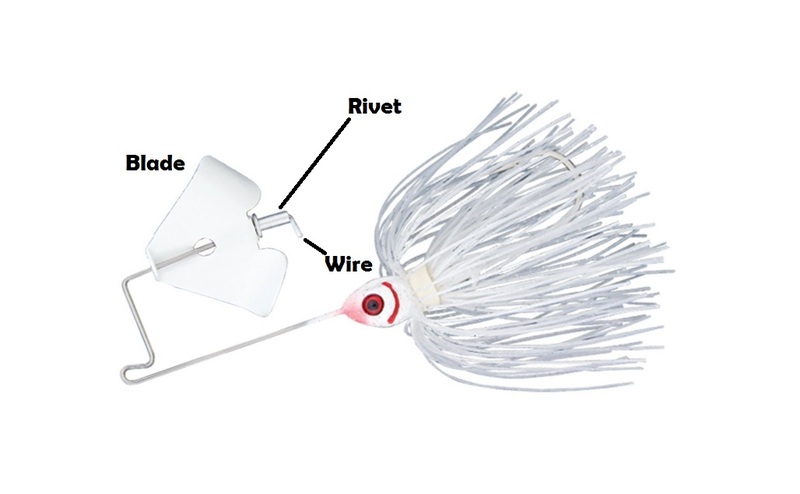 As I mentioned above, my first choice is a buzzbait but there are some topology conditions you need to pay attention to. For one, top water work best near weeds that are near deep water. The reasons for this are varied but suffice to say, that fish like a place to run to and deep water is always best. So if you are scouting a lake by map ahead of time, look for areas where a weed bed is near deep water. And by deep water, I mean - deep depending on the time of year. Too warm or too cold can cause fish to go deep. But temperate waters mean bass could be very shallow. So weeds in 2 feet of water could be fine at one point but at others, you'll need weeds near 8ft of water. But again, remember the grocery store in winter analogy here. Buzzbaits: These work best near structure and even better under structure. Ok, so this probably doesn't make sense, but a good fisherman isn't just looking for structure under the water, but also over the water. You should be looking for trees over hanging the water when using buzzbaits. Specifically trees over deep water. Bass will sit in the deeper water staring upward to see if something falls in. I've had bass take my lure 1 foot from shore almost before it enters the water. Why? Because they were sitting there staring at shore, *waiting for something to fall in*. So you'll want to cast your lure as close to shore as possible. If you can, cast it *on shore* and pull it off. You MUST keep your cool when doing this as often bass will smack the lure around to attempt to "disorient the bait". Keep it moving and don't flinch and you'll often be rewarded with the classic rundown of a big bass. Buzzbaits also work well on rivers for crossing currents. 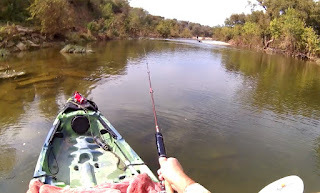 If there is a pinch point, I will cast my bait upstream above the current and then buzz down through the current and out the other end into calm water. Some times I get hit above the current, sometimes below. I'll also buzz across the current by standing across a river from the current and pull perpendicular to the current. I'll try to cast all the way to the other side to cross through the eddies on either side of a current areas. These eddies are often where I get a hit... rarely in the current. Though Guadeloupe Bass will often hit right in the middle of a current. It's rare that a buzzbait works in the middle of a lake. Though they will often work in a school of shad in the middle of a lake where the shad are schooling. But I've not been as successful with this method. There are other lures better for this method. Poppers: Also an under-the-bank type lure but they also work farther away from the bank. When you drop a popper in the water, let it sit for a good 10 seconds before moving it. Like a bug that just fell in the water and is now in shock. Sometimes you'll get a hit while you're waiting. I've had this happen more often than not. Before you start popping, twitch it lightly. This often will initiate a strike because now they *know* it's alive. After this, pop it about 3 times and then pause. Pop it 1 or 2 times and then pause. Like a critter that is disoriented. No pattern is the best pattern. One note: There are many far too many types of poppers to talk about. Some use different methods to make them work properly. You'll want to experiment with them and with the action they need to be used. I'm only differentiating between the kind of poppers that go "pop" with a concave nose, and those with a buzz on their tail. There similarities, but huge differences as well. Otherwise, a popper is a popper and each type is use the same, but may have distinct differences in how to use them. Buzz-poppers: I call them this because they are a floating bait that has a buzz blade mounted at the tail end or both ends. I especially like the Heddon Torpedo. These are similar to poppers in that you can fish them very slowly at times. Drop them near structure or near a weed bank and let them sit. Then start twitch and popping. Sometimes fish respond to these if they are pulled for a foot or more and then stopped. This imitates a scared shad. Pull, then stop and wait for 3-5 seconds. Count the seconds if you have to. This lure can also be used much like a Zara Spook. Spooks: These lures are in a category all their own. There are several ways to use them but I've found that often unconventional methods will work best. I will use them much like a popper, but I've also been known to pull them in short pulls like the torpedo above. Then of course, there is the classic "walk-the-dog" method. Don't ask me why, but I've had less success with walking-the-dog than any other method. It only seems to work during specific times of the year at only in the evening or early in the morning. There are many other type of top-water lures and I'm sure there'll be many more made. All have their method of using and some will work better than others. For me though, I prefer the buzzbait. It simply works. I've caught so many fish on buzzbaits that it is now the first thing I cast if at all possible. Some days the wind is just too rough or the temperature differential is too great and then I switch to other baits. But as often as I can, I cast a buzzbait. My favorite buzzbait? Contrary to popular belief the biggest fish are not always caught on the biggest lures. To be sure, when the time is right, cast the biggest and baddest buzzbait you can find and you'll be surprised at what goes for it. There are a couple brands of double-bladed buzzbaits that seem to draw out bass during the summer time. But these aren't always the proper solution and will often scare more fish than they attract. More often than not, you need to cast a finesse buzzbait and that's why I cast a small buzzbait like the Booyah Pond Magic buzzbait. And I usually only cast two different colors. White or Purple. The reason for this is profile. On a bright clear day with clear water, I cast white. When its early morning or dusk, or if the water is particularly stained dark (but not muddy), then I'll throw purple. For some reason these two colors have been the most successful. Red will sometimes work better than purple at dusk depending on the water, and sometimes a limetreuse will work better than white on certain days with murky water. But otherwise, it's white or purple depending on the light. I've caught so many fish on these two lures I've been able to completely wear a lure out to the point of throwing it away. I would be hiding something if I didn't tell you my secret weapon when it comes to these baits though. I don't remember who or where I read this, but somewhere I along the way, I learned to modify my buzzbaits to make them... squeak. This is exceedingly important. Without the squeak, they are literally half as effective. The steps to modifying them is slightly tricky and I'll see if I can post a video some time of how I modify a Pond Magic buzzbait, but here's the steps. I'll try to be as clear as possible. 1. Notice the top of the rivet (top being to the left). This has a flat surface that rubs against the blade. You want the blade surface that rubs the rivet and the rivet surface to be as flat as possible. This requires using pliers or small hemostats to flatten the edges until they are perfectly flat. Both the flange of the blade and the rivet need to be completely flat against each as the blade turns. It's easier to do this before you do the next step but the next step is most important. 2. Crimp the rivet on the wire so it cannot move. You need to make sure this is crimped so the rivet is completely flat against the blade flange. Crimping the rivet is the single most important thing you can do. If you do nothing else, do this. This crimping will cause the rivet to stop spinning, which then causes it to rub against the blade base. By doing this, it will eventually squeak of it's own accord even if you do nothing else. 3. However, to speed up the process, scrape the paint off the bottom of the blade portion that touches the rivet. This will then expose bare metal to the rivet and will encourage the squeak to form quicker. 4. And that brings us to the final step: Use the bait about 10-15 times on super long casts or run it in a current for a good 5-10 minutes. This will rub off any remaining paint and create a smooth surface where the squeak comes from. As you use it, you'll notice it will start to develop a squeak. The louder the squeak, the better chance you'll get a hit. My speculation on this Booyah lure is that the lure imitates a critter that has fallen in the water. The squeak may give the fish the idea that the critter is panicking and crying out as is tries to get away. Whatever it is, this action plus sound creates a volatile response in bass at certain times of the year and will draw them out of a deep sleep at other times. Without the squeak, the bass will still hit the lure, but will often ignore it. One other caveat on this lure: The skirt is often just a tad too long and gets caught in the blade. Trimming up the skirt helps keep it out of the blade. This is important since when the skirt gets stuck in the blade, it doesn't squeak. You can get the skirt unstuck while you are pulling it in by giving it a quick jerk. This action will sometimes invoke a strike anyway so it's not a bad thing to try. This lure works. In fact, it works so well I've had hungry bass meet my lure at the water more times than I can remember and I've had bass leap out of the water from a yard away to come chase my lure. I've had fish come from 15 feet away come chasing down my lure and it's all I can do to keep from jerking it way prematurely. A couple tips on casting a tiny buzzbait: You need to get this lure as close to your structure as possible. If you are casting to shore to imitate something jumping into the water and swimming, then you need to get within 6 inches of shore. Yes, you really MUST get that close. Especially when the water gets deep quick. If it's shallow near shore it's not as important, but there is a continuity issue here. The fish may be 3ft from shore, but if the water is clear, it can see where the thing lands. If it lands too far away from shore, it may ignore it because something doesn't seem right. Imitation is the key here! If your structure is a tree stump, log, etc. then you need to cast past if it possible and pull the bait past the structure as close as possible. Even bumping the structure isn't a bad idea. I've had bass chase a lure around a stump or go under a surface log to catch a bait. When they go on the attack they don't lose site of it easily and playing hard to get is part of the game to make the bait seem realistic! Casting into grass or weeds is the hardest. For grass you are most definitely going to get snarled up with a buzzbait. But not so much with some weeds. You'll have to experiment. It also depends on the time of year. Certain times of the year grasses and weeds are more springy, but if they are dead or limp, they'll grab your lure and hang on. For instance, when alligator weed is green and healthy you can drag your buzzbait right through them, over them, etc. They will often bang through the weeds in a reckless pattern causing some fish to go hog-wild! This works well with all type of buzzbaits except double-bladed types. But when the weeds are dying in the fall, they are horrible and won't let your lure pass for anything. However, once they are completely dead in late winter, you can often pull your lure through if they aren't too thick. Finally, I learned the most about the white Booyah buzzbait from the Guadeloupe Bass. These bass love this bait. I've caught hundreds of Guads on this bait over the past few summers. Some of those fish were near record breaking size. Don't discount the buzzbait, or any other top-water bait. Being in the right spot is far more important and sometimes the bass aren't interested in anything that's swimming below the surface. I've made this experiment many times since both my wife and I fish together much of the time. She'll fish a spinnerbait and I'll fish a buzzbait. More often than not, I'll out fish her. We'll sometimes switch baits so she's using the buzzbait and then she out-fishes me. So the success rate of this lure is phenomenal. There are many different kinds of top-water baits. Using them takes a special skill but so does pitching worms or crawling a football jig. But most of all, before you start quoting old wives tails about when a lure doesn't work, make sure you know what you're talking about first. Don't take someone else's word for it. Once upon a time I was a newbie fisherman who didn't know anything about buzzbaits. 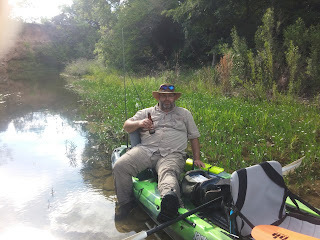 I watched some youtube videos and headed out to fish. They worked and so I started using them all the time. The naysayers told me I was foolish, but eventually I proved them wrong simply because I was too stupid to know better. Now I know that those naysayers are really the ones who are too stupid to know better. Don't be one of them! Go out and get you some of that top-water action! See you *on* the water!